Do you have any photo of this lighthouse? The Lighthouse is a small, now unmanned, light which marks the north end of Cardigan Bay. The stone tower is 10.7m (35ft) high and was built in 1877. The lighthouse keepers' cottages are now privately owned and used as a holiday home. The light has a range of 14 nautical miles and is 46 metres above high water. The tower is painted white. St Tudwal’s Lighthouse is on the small island of St Tudwal, off Penrhyn Du, Tremadoc Bay, Gwynedd. In 1876 the site of the lighthouse was purchased by Trinity House for £111, and the construction of the tower and housing completed the following year. In 1922 the light was converted to acetylene operation and was operated by means of a sun valve. This mechanism, which was invented by the Swedish lighthouse engineer, Gustaf Dalen, consists of an arrangement of reflective gold-plated copper bars supporting a suspended black rod, when lit by the sun the black rod absorbs the direct heat and that reflected from the other bars and expands downwards, cutting off the supply of gas. Following the introduction of the acetylene equipment the lighthouse was automated and the keepers houses next to the tower were sold in 1935. St Tudwal's Lighthouse was modernised and converted to solar powered operation in 1995. The 1 storey keeper's house was sold as a private residence in 1935, the entire island on which the lighthouse stands is now privately owned. Round cylindrical masonry tower with lantern and gallery, painted white. 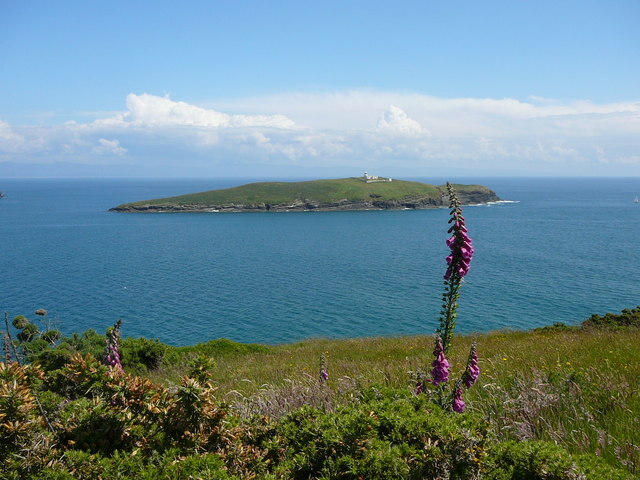 On St. Tudwal's Island West, at the western entrance to Tremadoc Bay about 5km (3 mi) southeast of Abersoch.